Dimensions: 40,5" x 19" x 32,5"
It has many advantages – the main one is that the tricycle grows with the kid. The recommended starting age is 18 months but you can start with the "rock" version even at 12 months. 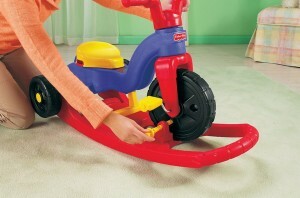 After some time just convert the base into a handle so you can comfortably stroll while your child learns to pedal. 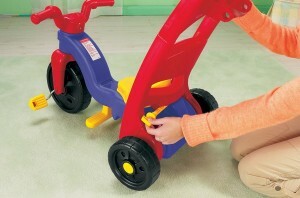 The handle will surprise you how easy is to maneuver the trike. It will take some time until the kid is able to reach the pedals so a footrest is also present. And when children are ready to ride on their own, just remove the handle, adjust seat, flip up the footrest and riding by pedaling can begin. 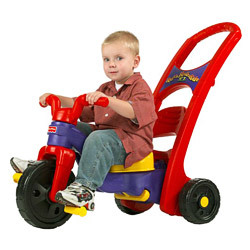 This system is really the main advantage of this tricycle – provides so much fun for so long, some kids use this trike even to their 6th birthday. Another plus – Fisher-Price Rock, Roll 'n Ride Trike is very sturdy and durable, you can use it even for five years without main defect. Balance is also on a very high level, it`s not prone to tipping like a lot of other tricycles – which ensures the safety of your kid. The only problem we were able to find were the plastic wheels which can be slippery on some surfaces or when riding uphill. Sometimes the kid is just spinning wheels, going nowhere – if this happens to you, wrapping rubber bands over the front wheel helps a lot. Also when riding outside, the plastic can get scraped up – and can scratch your floors afterwards when riding indoors. This entry was posted on Friday, May 13th, 2011 at 3:58 pm	and is filed under Fisher-Price, Kids.